Firebase is a customizable mobile platform with several common features such as authentication. For those just getting started with the platform, I've put together a brief tutorial on how to integrate with an Android application. We will start with a introduction to Firebase, including some of its components. For the purposes of this article, it is assumed that you, the reader, is already familiar with the basic components of Android applications. If you're not familiar, or just want to brush up on your knowledge, I'd recommend taking a look at this article on Android Basics. Once we've established what Firebase is and how it works, we'll apply it to build an Android app solution. So, let's get started! Imagine the following scenario: You have a Game Store, and you already run a website where users can buy your products. But, you don't have an easy communication tool where your customers can reach you quickly. So you might think to yourself: "Let's build a mobile app! This will allow us to have easy and fast communication between our customers and our store." And you would be right! But along with that idea come many questions, such as: "What's the best way to do it? How can we create a tool like this? Will we need an authentication for the users?" and many others. To solve these questions and help you to quickly develop a high-quality app, grow your user base, and earn more money, Google created the mobile platform known as Firebase! The platform is made up of complementary features such as a database and authentication that you can mix with your application to fit your needs. Store and sync data in real-time with JSON format. A complete authentication system that supports email & password, Facebook, Twitter, GitHub and Google Sign-In. Deliver and receive messages across platforms reliably using a cross-platform (Android, iOS and Web) tool known as Firebase Cloud Messaging. Store and serve user-generated content such as images, audio, and video directly in your mobile app, using the Firebase SDK's. In this article we will talk about how to use the real-time database and authentication for the Android chat that we will build. Before we start to implement the application, we need to setup the Firebase. To use the authentication provider, you need to enable it in the Firebase console. Go to the Sign-in Method page in the Firebase Authentication section to enable Email/Password sign-in, and any other identity providers you want for your app. Let's create a example user so we can test the login after we implement it. Navigate to the Users tab and click the Add User button. To finish, let's change the rules of the database so we can read and write it. Just set both to true, as shown in the example below. The app is structured according to the image above. There is only one activity that will be responsible for replacing the screens, created as fragments, so all the change screen logic will be located in one place only. Replace the current fragment to show the ChatFragment. Replace the fragment to show CreateAccountFragment. Replace the fragment to show the LoginFragment. The MainActivity will implement this callback, and all fragments in the attachment process will get a reference from this callback. Let's start with the creation of the MainActivity that will hold all the logic to change the fragments. We will need a layout to be the container for the fragments, so for the activity, create a layout file called activity_layout.xml and add a frame layout to it. 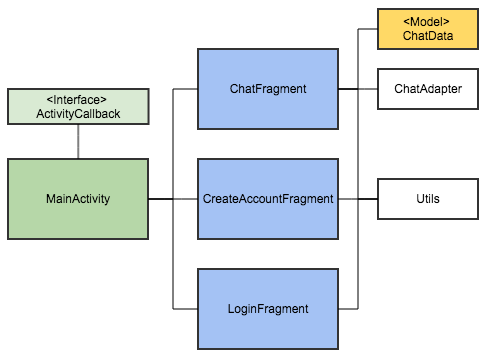 Next, let's create the interface that will be used as a callback by the fragments to implement the logic of logout, open chat or open/create account. We now have the layout and the callback, but we still need to create the activity and implement the ActivityCallback. In this second step, we will create the login and create account fragments. Afterwards, we will integrate with the Firebase authentication tool. And with the second one, onDetach, we will set the callback reference to null, (to avoid needless leaks with a reference in memory). Now, let's go back to the MainActivity to add the code to open the login fragment when we first enter the application. We can also implement the content of the callbacks for opening the Create Account and Logout, since we already have both of these fragments. The method above called attemptLogin() will be used in the next section, so don't worry about it for now! OK, we now have all the basic setup - time for the fun part! We're now ready to integrate with the Firebase Authentication tool! Obviously, this needs to be done in both fragments, Login and CreateAccount! Now that we have the instance from FirebaseAuth object, in the CreateAccount screen we can call the createUserWithEmailAndPassword in the click listener of the button. This method accepts two String parameters, email and password, so just retrieve from the EditTexts in the UI and send. But how can we test whether the operation was completed successfully or with an error? Using the previous method, return a Task. In this object, you can set an OnCompleteListener to determine whether the oepration was successful. The task object has another two listeners: OnFailureListener and OnCompleteListener. The first one is called only when an operation is not successful, and the second one, every time any operation is executed. For our purposes, we will only use the OnCompleteListener. When the onComplete method is called, we need to verify whether the task was successfully executed and do the logic. When the user account is created, the Firebase does the login automatically, so we don't need to do the login call again. Instead, we'll simply call the callback method mCallback.openChat() to navigate to the chat screen. The parameters are the same as what we see from the UI screen (email and password). The difference here is that instead of receiving a task instance onSuccess callback, we will only receive the AuthResult object that contains the information about the logged user. So to verify if the action was or was not successful, we need to add the OnFailureListener and do the logic there. For example, we can show a dialog or a toast to the user alerting them to the failed login. The layout will be composed by a RecyclerView, with every message shown as an item in the list so you can customize the rows. We'll also include one EditText to receive the input from the user. For the item row, we'll create a CardView layout with two TextViews, one for the username and the other for the message itself. Now that we have the layouts, we can create the fragment and the adapter for the screen. Don't forgot to attach the ActivityCallback from MainActivity to both fragments (again using the two fragment methods of onAttach and onDetach). Note: the creation of the adapter will not be covered here. If you need some help or would like more information about it, you can check out this link with documentation and examples. Now that all fragments, the adapter, and layout are set up, it's time to integrate with the Firebase. In this fragment, we will need to have the FirebaseAuth instance to logout the user, the DatabaseReference, which serves as the reference of the database to write/read the chat messages, and a FirebaseDatabase to get the specific DatabaseReference from. Before we begin to write and read data from the database, let's create a model that will represent the structure of a message item in the database. Basically, our JSON format will be a list of message "objects" that will contain the name of the user(email), id of the message and the message itself. So, for our project, let's create a class called ChatData with three String fields. One detail: don't forget to add an empty constructor and public getters and setters for the class variables. This will be important when we go to save and read the values from our database. For more information about how to structure the JSON, consult this link. Now that we have our model, let's read/write the values in our database! The FirebaseDatabase gives us several methods and a listener to verify things such as when the entire database has been updated, when a specific child was updated, etc. In this case, we will get the updates for all changes, so you can add more people to the chat and create a room for talks, for example. So for this, we add the ValueEventListener to the DatabaseReference. It contains two methods: one for success, onDataChange, that will return the snapshot of the database, and one for error, onCancelled, which is called in the event that this listener failed at the server due to security and/or Firebase Database rules. A DataSnapshot instance contains all the data from a firebase database. Any time you read Database data, you receive the data as a datasnapshot. Essentially, these are efficiently-generated immutable copies of the data from a firebase database. They can't be modified, and will never change. Now that we know how to listen for data changes, let's go back to our chat app and handle the dataSnapshot of the callback. For the custom objects, the class that defines it must have a default constructor that takes no arguments and and public getters for the properties to be assigned. The contents of your object are automatically mapped to child. Using a Java object also typically makes your code more readable and easier to maintain. So in our case, ChatData will be our custom object 😁. In the code above we get the reference from the input EditText and set the EditorListener. With the action method, we get the child from the database reference object and set the content with our custom object. We use the child as a timestamp so we can have all the information changed in the chat. You can use the username as child so that every time you update the database, the specific child (if already exists) will be updated. That’s it! Now we have a real-time chat app in Android using the Firebase platform! As we can see, this excellent solution from Google provides us with an easy-to-implement platform for use with our apps, that requires minimum time implementing the backend.